The following is a guest post from Dave Van Knapp, the author of The Top 40 Dividend Stocks for 2009. Make sure to check his site from this link. In long-term dividend investing, one needs to control risk in many areas. Risk comes in many forms: selecting unsound companies; purchasing companies whose dividends are in peril; creating a portfolio that is insufficiently diversified; and so on. Two important areas of risk to a long-term dividend strategy are the initial yield and expected growth rate of the dividend itself. If you start out with too low a yield, it will take many years for the dividend to grow to where it provides a worthwhile return on your original investment. On the other hand, if you start out with too high a yield, it may well be that the dividend is unsustainable and in peril. If the company typically increases its dividend at too slow a rate, again the dividend will take too long to grow into a desirable return. 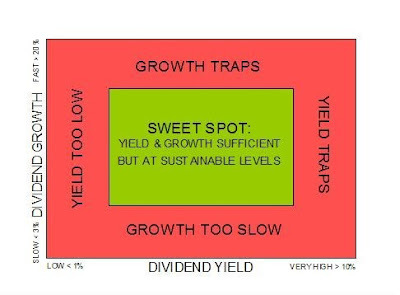 On the other hand, if you anticipate too fast a growth rate, the company may not achieve it.Plotting these two characteristics against each other--initial yield and anticipated dividend growth rate--gives us a diagram of the "sweet spot" in dividend investing. On this diagram, the left (vertical) axis represents the dividend’s likely growth rate. It ranges from very slow (say less than 3 percent per year) to very high (say 20 percent per year or more). The bottom (horizontal axis) represents the initial dividend yield, from very low (less than one percent) to very high (greater than 10 percent). The left edge of the chart is where the stock’s yield is simply too low to be attractive. I seek initial yields of 3 percent or more. Fortunately, because of the long bear market, a lot of quality stocks that formerly would not have cleared this hurdle now offer yields over 3%. The lower edge is where dividend growth is too slow. Generally seek a growth rate of at least 4 to 5 percent per year. Even in this slow economy, many quality dividend companies have increased their dividends in 2009 by attractive amounts. Examples would be Abbott Labs (ABT, 11%); Coca-Cola (KO, 8%); Chubb (CB, 6%), Procter & Gamble (PG, 10%), Colgate-Palmolive (CL, 10%), and PepsiCo (PEP, 6%). The top edge is labeled “Growth Traps.” This is where the dividend’s growth rate is probably unsustainable because it is too high. It’s a “trap,” because a high dividend growth rate is usually an attractive quality in a dividend stock. But when the growth rate is too fast, it usually cannot be continued. The very high growth rate may be a red flag that the company is over-extended in its dividend policy and will need to pull back. The risk in stocks with a high dividend growth history is that continuation of a very high rate of dividend growth is unlikely. Many value investors (including Warren Buffett) consider annual earnings growth of 15 percent to be about the maximum sustainable for long time periods. The right edge is labeled “Yield Traps.” Again, a high yield is a good thing, up to a point. But extremely high yields often point to a problem. The reason the yield is very high is probably because the stock’s price cratered. While that could simply be the byproduct of the bear market of 2007-2009, it could also be a reflection that the company is in serious difficulty and will need to cut its dividend soon. In 2008 and early 2009, we have seen this time and again, especially among financial firms. It should go without saying that the very finest dividend stocks suitable for a long-term dividend strategy are not in danger of cutting their dividends. The green area in the middle is the sweet spot: Initial dividend yields of between about 3% and 9%, combined with dividend growth rates of about 4% to 17%. Those are generally sustainable numbers, and it is where we will find most of the best dividend stocks for long-term investing.